A quick post on this one. Sophos Antivirus was working fine. Updates were downloaded. Clients were updated. 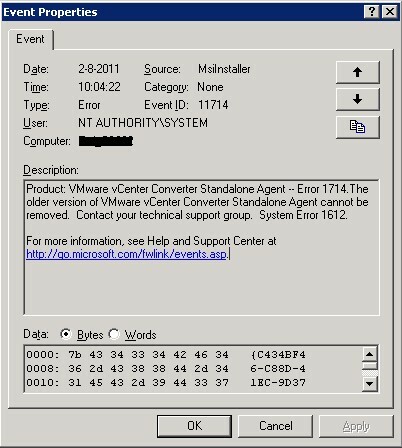 The Enterprise Console however didn’t display the current statistics and showed error “An update manager has not updated since <insert date>”. After many hours of browsing the Sophos Knowledge base and troubleshooting I finally stumbled upon a post that drew my attention. Although this post was almost a year old and handled software of 2 minor versions back (4.5 instead of 4.7), I decided to give it a try anyway. After uninstalling Microsoft .NET Framework 4 for Windows Server 2008 x64-based Systems (KB982671) and the Client Profile (and 2 reboots), the Sophos Enterprise Console started to display current data again. This would make more sense to me if the updates were installed a day (or week) before the error occurred. The updates were, however, installed months earlier. I hope this info helps you before wasting hours of troubleshooting! When doing a p2v I always use the standalone version of the Converter software. It proved to be more stable than the vCenter Converter plugin. I checked the uninstall string and tried a manual uninstall, but of course that failed too. The installation MSI wasn’t available on the server anymore. This is a problem many of us will have faced. Quite annoying. In this case, however, the software is still available for download on the VMware website (Thank you VMware for keeping some of the older versions available). So I downloaded VMware vCenter Converter 3.0.3 Enterprise Edition. I didn’t want to install the software, so I extracted the VMware Agent.msi from the installer by executing VMware-converter-3.0.3-89816.exe. This will extract the MSI installer to a subdir of %TEMP%. From there I used UniExtract to extract the files from the MSI. 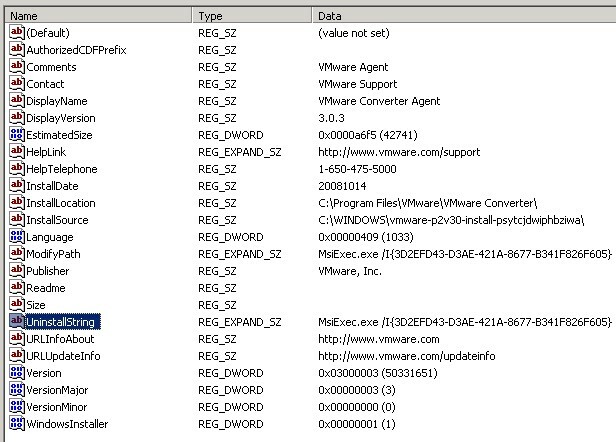 In the subdir ‘VMware Converter\program files\VMware\VMware Converter’ that will be created by UniExtract, I found the file I needed; VMware Agent.msi. 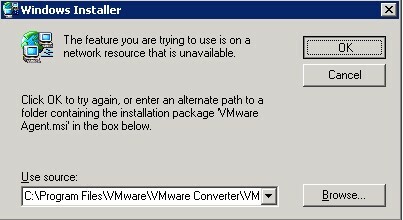 I copied it to another folder and stopped the installation of VMware vCenter Converter 3.0.3 Enterprise Edition. I had to manually delete the extraction folder. 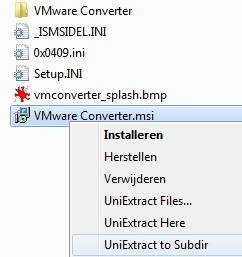 I copied the VMware Agent.msi to the server I wanted to P2V, pointed the VMware Agent uninstaller on the server to the MSI I just copied and was able to complete the uninstall of the ‘old’ Converter agent. From here, the installation of the ‘new’ vCenter Converter Standalone agent went smoothly. The P2V ran without any problems. So I was able to put another old hardware server out of commission. Hurray for virtualization! After virtualizing yet another server onto our vSphere platform I was confronted by a bunch of annoying Windows policies. I decided to disable them by renaming the registry keys HKLM\SOFTWARE\Policies\Microsoft, HKLM\SOFTWARE\Microsoft\Windows\CurrentVersion\Policies and HKCU\SOFTWARE\Policies. This was the cause of my problems. I decided to do this quick ‘hack’ because the server is on it’s way out. It has several software problems and will be out of service soon. After the reboot I was able to configure the server the way I wanted. I realized, however, it did not have any network connectivity anymore. After some searching I found that the IPSEC Services service failed with the error ‘Error 2: Cannot find the file specified’. I checked the path to the executable “C:\WINDOWS\system32\lsass.exe” and it was fine. The executable was there too and it had the same size as a correctly working server. I turned to Google and quickly found my problem and the solution: KB912023. It was quite clear I was the cause of this problem. What a waste of time, sigh. Enough reason to put it on this blog!